The Leo Triplett of interacting spirals, M65, M66 and NGC 3628, the 3 dominating members of the M66 group of galaxies, just fits the 1 square degree field of view of the 3.9-meter Anglo Australian Telescope. This image was created by David Malin. It is copyrighted and may be used for private purpose only. For any other kind of use, including internet mirroring and storing on CD-ROM, please contact the Photo Permissions Department (photo at aaoepp.aao.gov.au) of the Anglo Australian Observatory. 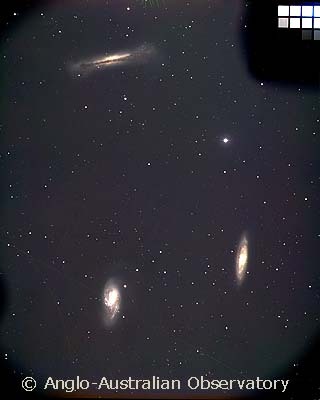 This small group of galaxies consists of the Messier objects M65 (NGC 3623), lower right, and M66 (NGC 3627), lower left, along with the edge-on spiral galaxy NGC 3628, upper left. 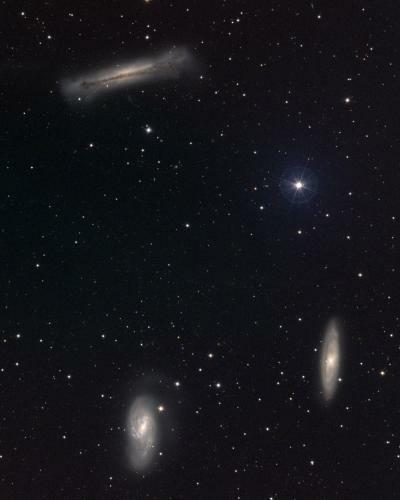 These three galaxies form a rather attractive triplet at the heart of the M66 group, which includes a number of other galaxies which are "out of shot". At a distance of 35 million light-years, maybe a little further, the M66 group may be related to the M96 or Leo I galaxy group. This approximately true-color picture was created from images taken in June 1995 using BVR colors, at the Burrell Schmidt telescope of Case Western Reserve University's Warner and Swasey Observatory located on Kitt Peak, near Tucson, Arizona, during the Research Experiences for Undergraduates (REU) program operated at the Kitt Peak National Observatory. Image size is about 40.6x50.8 arc minutes.